Shoe wear patterns are the predominant question I get about shoe prescription. Patients frequently ask about wearing out certain parts of the shoe, what that means, if the shoe is right for them and so on. 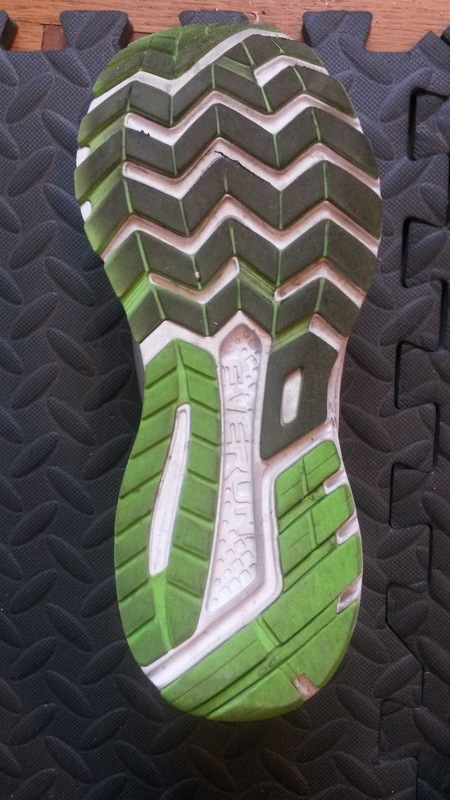 Long ago when I was working in running stores in college, I was confused that so much emphasis was put wear patterns telling people if the shoe was right for them. As I advanced in my understanding of biomechanics, then into a doctorate in physical therapy and further discussing this with clinicians all over the world, I realized that we have almost no evidence regarding wear patterns and shoe prescription. The internet is full of blog posts, articles and links describing shoe wear patterns telling you all these intricate things. Here's the problem: there's almost no research on this. Almost all (if not all) of those posts are simply anecdotal evidence. If you look at almost all of the articles out there, they do not cite any research. This includes posts BY CLINICIANS. Now to be fair, this post will contain a great deal of anecdotal data and comments. However, I have compiled a list at the bottom of this post with a few articles that have been published for further reading. I hope with this post to give a little more information into why certain wear patterns could mean certain things, but want you to take this with a grain of salt. The most important thing to remember is that WEAR PATTERNS MEAN NOTHING WITHOUT OBSERVATION OF ACTUAL MOVEMENT. I would describe them as a small side dish of a main course. Wear patterns offer clues to how a person might be landing but they do not tell me why. They offer a small glimpse of a puzzle but do not give the full picture. Which further is emphasized by Vernon & Potter (2004) who state there is no one wear pattern condition that goes with one pathology. It is more complicated that that. Even research attempting to use wear patterns have admitted the difficulty of establishing links between pathology and abnormal patterns due to lack of established reliability (Barton, Benanno, Menz, 2009). 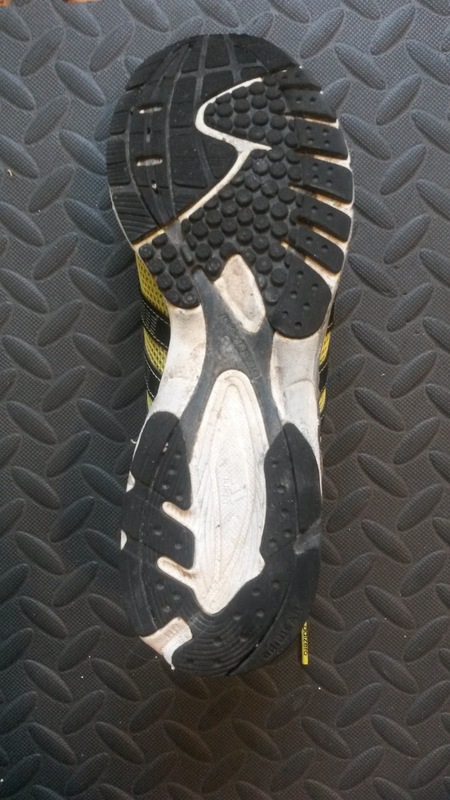 From my view, outsole wear patterns gives me more hints about how the foot is functioning and how much force the person is putting into a certain area, not if the shoe is right for them. Think of this as a really slow and not very accurate force plate. Sole wear comes from friction and loading, thus areas that have excessive wear may correlate to higher loading in that area. However, this gets more difficult due to the fact that to really see wear patterns, a person needs to put a ton of miles on a shoe which takes time. Over that time, who knows what kind of surfaces they were running on, what the tilt of the road did to cause certain patterns and many more factors that effect what you will see. So can you begin to understand why this is so complicated? Back to footwear, I'll keep this simple when it comes to footwear prescription. If the shoe is comfortable and does not cause pain or very abnormal biomechanics, you are probably fine. Running footwear prescription is currently not evidence based (Richard, Magin & Callister, 2008) and our research based understanding of how this effects the body is limited to expert opinion and minor research. Difficult to see on the Pegasus since the outsole is so durable. Fairly neutral wear in the middle of the forefoot and posterior lateral heel. Currently most of the research that has been done on wear patterns is on heel wear. Heel wear at the posterior lateral aspect in heel strikers is considered to be normal (Finestone et al., 2012). People who heel strike tend to land in an inverted foot position to give the posterior tibialis more room to eccentrically absorb force during normal pronation (pronation is normal). Thus they tend to land first on the posterior lateral aspect of the shoe and wear that area out first due to initial contact usually being one of the highest points of force (via impact. This does depend on a couple other factors including footstrike, muscle shock attenuation and more). Medial heel wear has been suggested to be early stage overpronation as the individual puts the most pressure from their collapse on that side. This tends to be more rare but a couple of the times I have seen this is from patients with a calcaneal valgus, ie where the heel is shaped pointing lateral (Vernon et al., 2004). Thus the medial side hits first. This is not a great condition to have and generally needs to be correct by orthotics. Others who tend to have very strong and fast overpronation may also see this as they roll onto the medial side quickly (but are more likely to have excessive wear on the lateral heel from initial impact). I also think this tends to be rare because most people even when they do overpronate tend to transition to the midfoot due to the forward progression of the foot. The last one I see is more excessive wear along the lateral aspect of the heel extending posterior to more anterior heel. 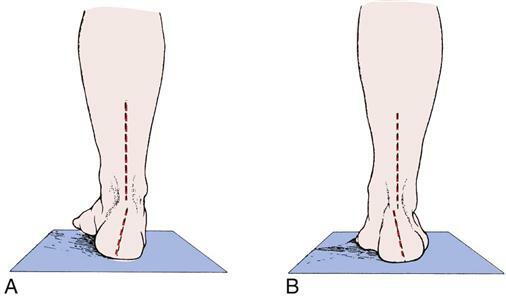 This tends to correlate more with heel oversupination at heel strike as the foot rolls outward upon initial contact and pressure stays on the outside of the foot (Vernon et al., 2004). This can also occur due to a calcaneal varus. A calcaneal varus means the heel is more tilted facing medially, thus based on the direction the patient is more likely to roll out (opposite of calcaneal valgus). 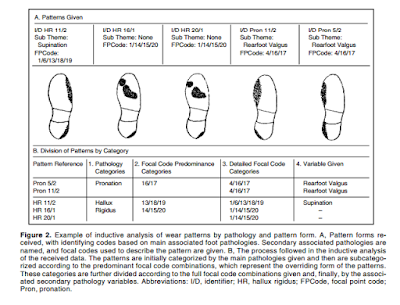 Forefoot outsole wear patterns have even less research than heel wear patterns. With the exception of plantar pressure research on those with diabetic neuropathies, there is not a great deal there. However, there is plenty of expert opinions as mentioned earlier. 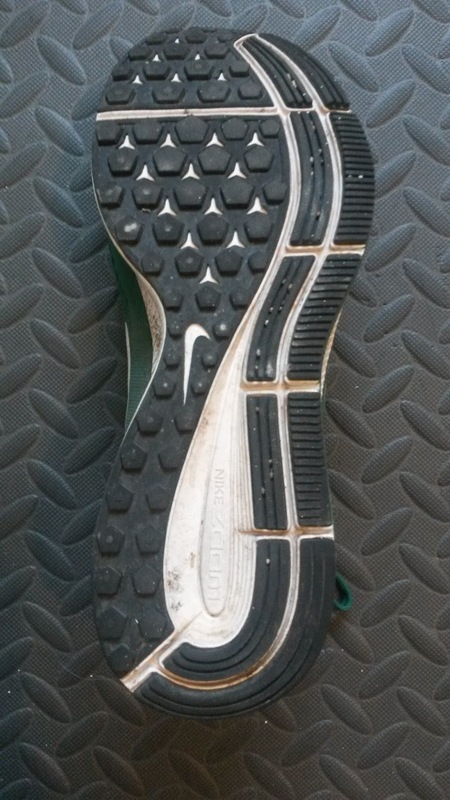 Generally when you have wear along the middle of the forefoot, that is considered normal (Vernon et al., 2004). The idea is you should be able to keep force centered with the first metatarsophalangeal joint kept down by the fibularis longus to balance out the inversion/supination torque created by the calves and posterior tibialis. Excessive lateral forefoot wear is a fairly common thing that I see. Usually this means that someone is supinating or inverting excessively during toe-off. This could come from a fibularis longus weakness and the body is avoiding putting pressure on the first metatarsal. It could come from excessive tightness of the calves or the posterior tibalis. It could also be coming from a forefoot striker landing very hard on the lateral aspect of the shoe, which is fairly normal for their gait. This is similar to landing on the posterior lateral side of the heel. Most people will land on the outside first to prepare themselves for pronation, which again is a normal method of shock absorption. Finally, excessive wear along the medial forefoot may be due to forefoot eversion or pronation during toe-off. This can from many reasons, including weakness of the posterior tibialis and failure to resupinate, collapse of the first metatarsal due to lack of fibularis longus strength, a forefoot positional deformity or a compensation for a calcaneal positional deformity. This is not a great place to toe-off from as it is normal for the foot to resupinate to a degree following pronation of the foot. I have discussed this frequently in the past that forefoot pronation may long term put individuals at risk for bunions due to excessively loading the medial side of the first metatarsophalangela joint (please see my post on sole flare for that HERE). Excerpt from Vernon et al., 2004. This study gathered expert opinions, not actual data. While this is only briefly mentioned in the research, I often look for asymmetrical wear patterns. Generally more wear on one shoe versus the other makes me suspect either weakness, abnormal biomechanics or possible leg length discrepancies. Most individuals will land harder on sides that have poor eccentric strength and will instead use joint loading instead of muscle loading for shock attenuation. While asymmetry to a certain degree in the human body is normal, excessive is not and can (but not always) be predictive of injury risk. However, this can also occur if you tend to run or turn asymmetrically in some fashion. An example being if you run on a track exclusively in one direction. You are constantly going one direction, which places asymmetrical loads on each side of the body. That is why I am a huge proponent of doing workouts both ways on the track for athletes to reduce risk for asymmetrically induced overuse injuries (a common issue I see is sacroiliac joint issues, but this is anecdotal). Another great example of this is running on the same side of the road all the time. The cant of the road acts like a wedge and will cause asymmetric loading if you don't find a level surface or make sure you spend equal time on the other side. Difficult to see with photo. More anterior lateral heel wear than expected potentially du eot heel bevel (shifts landing point forward), excessive inversion at contact or supination. The medial forefoot wear makes me think more over-pronation rather than supination. This is why you need to look at both the heel and forefoot if the person is a heel striker or in general watch the actual movement! The other problem with asymmetric shoe wear is that it can affect your mechanics. According to Sole et al (2010), asymmetric wear can actually decrease the number maximum number of single leg heel raises, aka the traditional measure of calf strength. Both medial and lateral wedges were utilized in this study, but those are no different than the wedges created by wearing down the outsole. When you shave down the medial or lateral heel from use, it creates a wedge under the foot that changes your biomechanics. This is one of the many reasons why when you see excessive wear on your shoes, you should change them! This may be affecting your body's ability to appropriately generate and attenuate force! 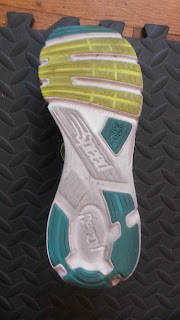 Another thing rarely mentioned is connecting how people transition from heel to forefoot, also known as the foot progression angle. The foot progression angle is defined as "the long axis of the foot from the heel to the 2nd toe" and is supposed to determine the line that individuals roll through (Cibulka et al., 2016). If I am going to look at wear patterns on heel strikers and some midfoot strikers, I want see how everything works. This involves connecting all the things mentioned above. If someone lands in an excessively inverted position and wears out the lateral heel quite a bit, what may be more telling is if they do that and excessively wear the far medial forefoot. That gives me a clue that they may be pronating excessively and are traveling a much larger distance in the frontal and transverse planes. Whereas if they are landing on the posterior lateral heel and wearing out the middle of the forefoot, they have less frontal plane motion and I may not be as concerned about that. Again I use this as a guide of what to look for, not what the final answer regarding an issue the individual may be experiencing. However footwear progression angle is somewhat useless in forefoot strikers as will you will not see wear at heel. THIS IS ALL ANECDOTAL. I have not yet performed a motion analysis study comparing gait deficits to wear patterns. To be fair, no one else has performed an extensive one either. So when you read this, know that although while I have attempted to scour the literature, you should take wear patterns with a grain of salt. Wear patterns, as I mentioned at the beginning, are a small piece of the puzzle. They do not give you the whole picture by themselves. They can give you interesting data that may help you get some starting ideas, but when you take a look at your own footwear or a clients, be careful not to jump to conclusions. Please take this post with an open mind. 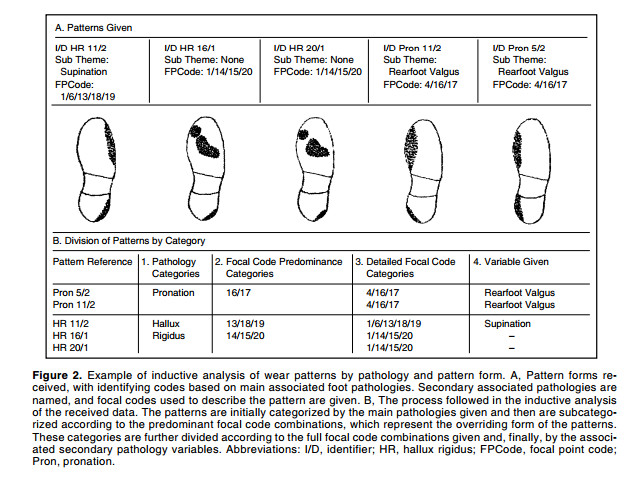 I did not fully address the potential effects of calceneal and forefoot rigid deformities on wear patterns and hope to address that in the future. However, keep in mind that as Vernon et al (2004) alluded to, there is no one wear pattern that is linked to one deformity. You have to look at the bigger picture by assessing the foot itself, watching the patient's gait, looking at strength and flexibility and I hope this post helps you to take a step back when analyzing these. Stop worrying about what the bottom of your shoe looks like (unless it is worn out) and think about how you are moving instead. *As always, my views are my own. My blog should not and does not serve as a replacement for seeking professional medical care. I have not evaluated you in person, am not aware of your injury history and personal biomechanics, thus am not responsible for any injury that you may incur from the performance of the exercises on this blog. This blog is meant for educational purposes only. If you are currently injured or concerned about an injury, please see your local physical therapist. Cibulka, M., Winters, K., Kampwerth, T,. McAfee, B., Payne, L, Roeckenhaus, T., Ross, S. (2016). Predicting foot progression angle during gait using two clinical measures in healthy adults, a preliminary study. International Journal of Sports Physical Therapy, 11(3): 400-408. Finestone, A., Petrov, K., Agar, G., Honig, A., Tamir, E., Milgrom, C. (2012). 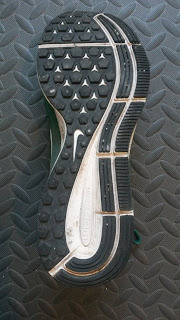 Pattern of outsole shoe heel wear in infantry recruits. Journal of Foot and Ankle Research: 5(27). doi: 10.1186/1757-1146-5-27. Perry, J. (1992). Gait Analysis: Normal and Pathological Function. Thorafare, NJ: SLACK Incorporated. Vernon, W., Parry, A., Potter, M. (2004). A theory of shoe wear pattern influence incorporating a new paradigm for the American Podiatric Medical Profession. Journal of the American Podiatric Medical Association: 94(3): 261-268.